Winnipeg, MB (Apr. 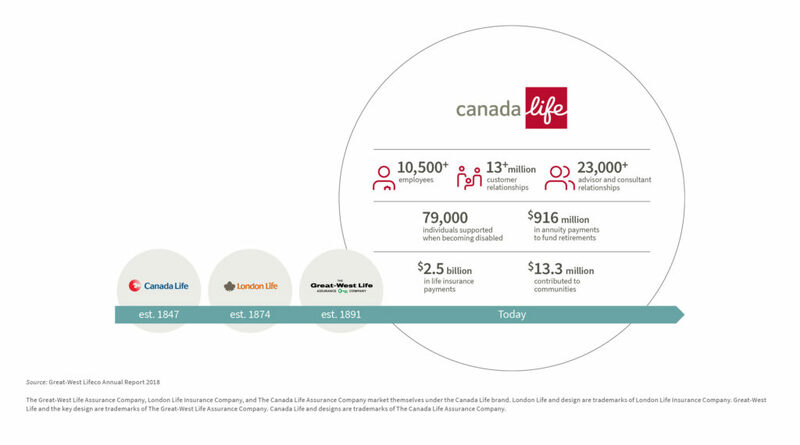 3, 2019) – Three iconic Canadian brands are coming together under one brand – Canada Life – to better serve their more than 13 million customer relationships across Canada and to position the companies for even stronger growth. For more information, visit www.canadalife.com. Winnipeg, MB (Apr. 3, 2019) – Today, Great-West Lifeco Inc. announced its three Canadian life insurance companies – The Great-West Life Assurance Company, London Life Insurance Company, and The Canada Life Assurance Company – are moving to a single brand in Canada – Canada Life. Great-West Lifeco is an international financial services holding company with interests in life insurance, health insurance, retirement and investment services, asset management and reinsurance businesses. Great-West Lifeco has operations in Canada, the United States and Europe through Great-West Life, London Life, Canada Life, Irish Life, Great-West Financial and Putnam Investments. Great-West Lifeco and its companies have approximately $1.4 trillion in consolidated assets under administration as at December 31, 2018 and are members of the Power Financial Corporation group of companies. Great-West Lifeco trades on the Toronto Stock Exchange (TSX) under the ticker symbol GWO. To learn more, visit www.greatwestlifeco.com.